For me, photography is a HUGE part of traveling! I currently own a Canon Powershot SD850IS, an underwater case, other accessories for the SD850IS, a Canon Digital Rebel XT, 3 lens (Canon EF 50mm f/1.8 II, Canon EF 28-135mm f/3.5-4.6 IS USM, and a Sigma 10-22mm f/4-5.6 DC HSM), and other accessories. I’m still in the market for a flash and a telephoto lens. (3) in the water, I’ll need a waterproof camera. 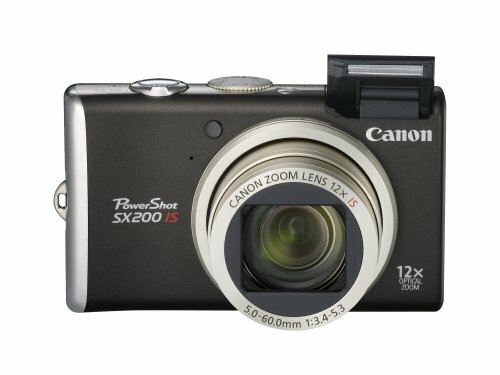 The Canon PowerShot SX200IS — 12MP, 3.0-inch LCD, 12x IS wide angle optical zoom (!!! ), has a lot of manual settings and I hear it’s a great transition to DSLR. I already have a DSLR but I admit I haven’t had the time to dedicate towards learning how to use all its settings. The lens I have now comes nowhere close to an equivalent 12x optical zoom! While it’s a point and shoot, it’s a little bigger than the ones I’ve had. My current sD850IS weighs 6.9 oz (3.5 x 2.2 x 1 in). The SX200IS is 7.8 oz (4.1 x 2.4 x 1.5 in). Bigger, but not BIG. I could forgo bringing my DSLR to Panama and just mess with the manual settings on the SX200IS. This would be great for getting quality shots, practicing with manual settings, while still saving space! Plus, 12x zoom!! Great for catching pictures of wildlife considering I don’t have a lens that comes even close to that type of zoom. Next, there’s the Canon D10. It’s got 12.1MP, 2.5-inch LCD, and 3x IS optical zoom. I have an underwater case for my camera but it’s fairly big and awkward! I also always worry that I still might accidentally get water on the camera when I’m taking it out of the case. I’ve heard good things about Canon’s first waterproof camera. As much as I’d love to get this camera, it’s at a price that’s only a little lower than the SX200IS and I already have a underwater case I can use for the time being. I’ve had the underwater case for less than a year (it wasn’t cheap!) and I’m thinking it needs a little more mileage before I retire it! I’ll save this one (and future models) for later! Instead of getting a new point-and-shoot, I could stick with the DSLR and get a flash and/or telephoto zoom. There’s the Canon EF-S 55-250mm f/4.0-5.6 IS Telephoto Zoom Lens. At $232.85 on Amazon, that’s pretty darn good! There are, of course, better lens, but the prices can’t compare! As for the flash, I could get the Canon Speedlite 430EX II Flash. It’s 243.76 on Amazon. I’d probably also get a cheap diffuser for <$20 along with it. This is one of those things that I’ll definitely eventually get. The flash on the body of the Rebel XT is not going to cut it, and this flash is a good one. It’s just a matter of when.